It has the same cute packaging with the fuzzy velvet lid and usual Models Own bottle. This is another easy-painter - it's quite a thick polish, because of the heavy density of glitter, but not too gloopy. It dries really quickly. Surprisingly for a Models Own black, I thought, it is the least opaque of the collection - the first coat is really sheer, but with a second it was properly opaque. Obsidian is described as a deep charcoal grey. 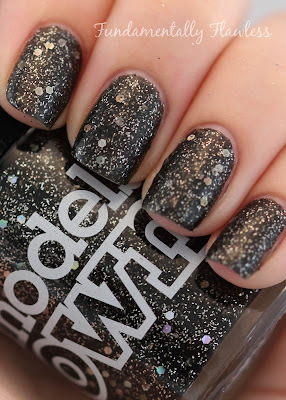 It is packed with tiny glitters - silver and black glitters in different size glitters, with some big hexagonal glitter like in Absinthe and Amethyst - so when on the nail, the coverage is fantastic and has real depth. The polish dries matte and pretty smooth (though I wouldn't say completely). Because it's essentially a glitter polish, it's a bit of a mission to remove - I keep meaning to give the tin foil method a go! 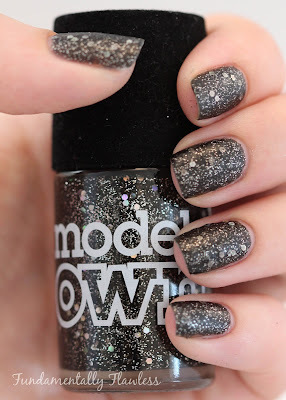 This is probably the most 'goth' polish of all five - I do love how it looks and it says biker or metal to me - so it isn't necessarily a polish I'd wear all the time, but it's a fun one to have in the drawer for the occasion to match. It can be glammed-up by adding a glossy top coat (see the last photo below) to smooth out the feel of the glitter. Click on these links for the swatches of the rest of the Velvet Goth Collection: Sardonyx (red), Amethyst (purple), Valerian (blue) and Absinthe (green). OK, this is the one for me. Looks absolutely stunning! !